The Daniel K. Inouye International Airport (HNL) in Honolulu is taking major steps forward in sustainability just in time for Earth Day, which is coming up on April 22. As part of a major energy-savings project for the airport, 2,980 photovoltaic panels are now installed on the 5th floor of the Terminal 2 (formerly the Overseas Terminal) garage. Last year, 4,260 solar panels were installed on the 7th floor of the airport’s Terminal 1 parking garage. “The completion of this phase of photovoltaic panel installation, along with the previous improvements, will reduce the airport’s electric bill by nearly half.” said Hawaii Department of Transportation Director Jade Butay. HDOT is working with Johnson Controls Inc. on a major energy savings project that includes replacing nearly 98,000 light fixtures with high-efficiency light-emitting diode (LED) technology and energy efficient lighting, upgrading ventilation and air-conditioning systems and installing more than 24,000 solar photovoltaic panels. Given all the sunshine in Hawaii, harnessing solar power at HNL airport makes perfect sense! Meanwhile, Hawaiian Airlines and Carbon Lighthouse, a clean energy services company, are working together on a pilot energy-saving project at the Hawaiian Airlines Airport Center, located near the Daniel K. Inouye International Airport. 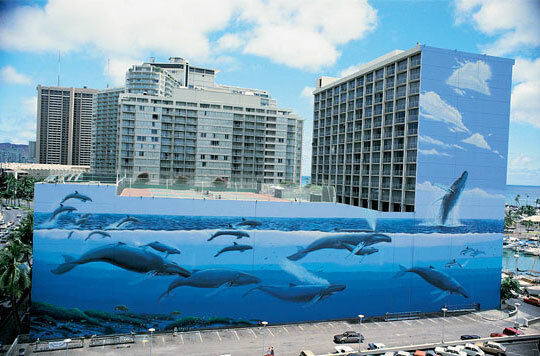 Hawaiian Airlines bought the 14-story office building — famous for its iconic whale murals — in 2016 and leases some of the space to tenants and occupying about 20,000 square feet for office space. To make the building more energy efficient, Carbon Lighthouse is deploying sensors throughout Airport Center to collect data on everything from air and water temperature and flow rates in HVAC equipment to lighting and occupancy. Using that information, plus weather, utility and other data, Carbon Lighthouse will identify way to reduce waste and optimize the energy use of the building.